If you’ve been gifted with brown eyes, then consider yourself lucky as you have a whole world of colors to chose from, to play on your eyes. And what better than a great eye shadow can be to highlight the features and beauty of your brown eyes? Couple the eye shadow with a healthy coat of mascara and a dramatic liner for a sizzling effect at any gathering. Or if you wish to keep it simple and sophisticated, leave aside the mascara and liner with just the right amount of eye shadow. Though you cannot use any color for eye shadow on your brown eyes, you surely have numerous shades to experiment with, such as greens, champagnes, bronzes, golds, browns, and blues. Pick up a color that suits your hair color, your skin color, or the outfit, and see how your eyes pop up and stand apart in the crowd. Check out eye shadow ideas for brown eyes as you scroll through the following text. Brown eye shadow is the most obvious and popular shade for brown eyes. Depending upon the color of your brown eyes, you will have to choose the eye shadow shade. If you have light brown eyes, pick up a color that falls between medium to dark shades of brown color, such as amber, mahogany, copper, and gold. However, if your eye color is dark brown, opt for a light or medium shade of brown, like basic cream, beige, tan, taupe, dark brown, and chocolate brown. On the other hand, if you are gifted with medium brown eyes, you can wear either light or dark brown eye shadow depending upon your suitability. With so many hues to choose from, purple is another perfect eye shadow for brown eyes. You do not have to worry about your skin tone to use a purple shade as any skin tone can carry this pretty and lovely color with oomph and finesse. While darker purple shades work well for evenings, you can reserve the lighter shades for daytime. Purplish-taupe, grayish, and metallic purples are some hues to experiment and sure you will thank us for suggesting such perfect and striking shades. For an ultra-soft and long-wearing finish, you can even use purple’s “cashmere” shade. 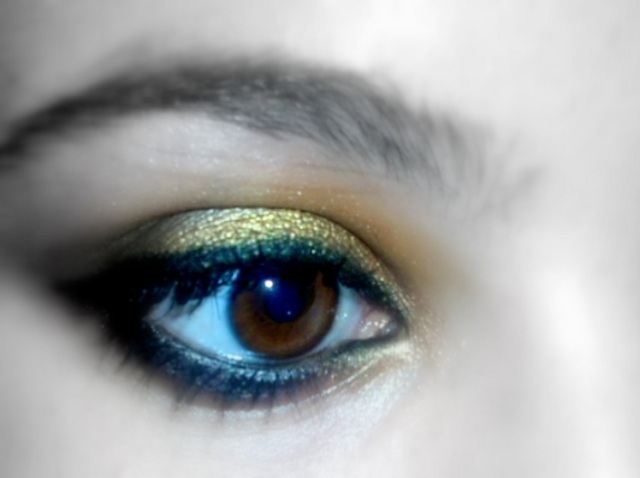 Applying blue color as an eye shadow to your eyes can be a little tricky. But, nevertheless, the right shade can add a sparkle to your brown eyes. While working with blue for eye shadow, keep your skin tone in mind as you cannot pull off any blue hue on any skin tone. Turquoise, navy, baby, and crystal blue are some shades of blue to experiment with. Avoid overdoing the blue color and apply just the right amount to highlight the sharp and playful contrast of your brown eyes. If the color of your eyes lean towards a hazel hue, green eye shadow will only add more sparkle, sizzle, and shine to your overall eye makeup. But do not pick up any shade of green and start playing with your eyes. You will end up turning into a dreadful witch and you wouldn’t want to sport that kind of a look, especially if you are preparing for a formal event. Hence, choose to look sultry and elegant with smoky greens, such as khaki, olive, or forest green. If it’s a casual occasion or informal gathering that you heading for, then jade, grass, or lime green are shades to opt from. Besides the above listed shades, you have so many other colors to try on your brown eyes and let their beauty and charm stand out. Pink, plum, burnt orange, gray, coral, aqua, and burgundy are some more suitable tones for eye shadow. Do not use them in heavy amounts, instead, keep their use to minimal for daily look at the office or for a lavish night in the town. Eye shadows for brown eyes also depend upon your skin tone. If you bear a yellow tint in your flesh, stay away from heavy amounts of yellow colors. Conversely, if you appear flushed, avoid using rose or red-based hues. Achieve a perfect sheen and natural look on your brown eyes with any of the above listed eye shadow colors. Let your chocolate eyes sparkle and shine throughout!